1. American Cancer Society. Key statistics for lung cancer. Revised January 5, 2017. www.cancer.org/cancer/lungcancer-non-smallcell/detailedguide/non-small-cell-lung-cancer-key-statistics. Accessed August 9, 2017. 2. American Cancer Society. What is non-small cell lung cancer? Revised May 16, 2016. www.cancer.org/cancer/lungcancer-non-smallcell/detailedguide/non-small-cell-lung-cancer-what-is-non-small-cell-lung-cancer. Accessed August 9, 2017. 3. Hirsh V, Melosky B, Goss G, et al. A personalized approach to treatment: use of EGFR tyrosine kinase inhibitors for the treatment of non-small-cell lung cancer in Canada. Curr Oncol. 2012;19:78-90. Erratum in: Curr Oncol. 2012;19:e228. 4. Massarelli E, Varella-Garcia M, Tang X, et al. KRAS mutation is an impor­tant predictor of resistance to therapy with epidermal growth factor receptor tyrosine kinase inhibitors in non-small-cell lung cancer. Clin Cancer Res. 2007;13:2890-2896. 5. Shaw AT, Yeap BY, Mino-Kenudson M, et al. Clinical features and outcome of patients with non-small-cell lung cancer who harbor EML4-ALK. J Clin Oncol. 2009;27:4247-4253. 6. Drugs.com. FDA approves XALKori with companion diagnostic for a type of late-stage lung cancer. August 11, 2011. www.drugs.com/newdrugs/fda-approves-xALKori-companion-diagnostic-type-late-stage-lung-cancer­2828.html. Accessed September 6, 2017. 7. US Food and Drug Administration. FDA approves new oral therapy to treat ALK-positive lung cancer. December 11, 2015. www.fda.gov/newsevents/newsroom/pressannouncements/ucm476926.htm. Accessed September 6, 2017. 8. Friboulet L, Li N, Katayama R, et al. The ALK inhibitor ceritinib overcomes crizotinib resistance in non-small cell lung cancer. Cancer Discov. 2014;4:662-673. 9. Shaw AT, Yeap BY, Solomon BJ, et al. Effect of crizotinib on overall survival in patients with advanced non-small-cell lung cancer harbouring ALK gene rearrangement: a retrospective analysis. Lancet Oncol. 2011;12:1004-1012. 10. US Food and Drug Administration. Brigatinib. www.fda.gov/drugs/informationondrugs/approveddrugs/ucm555841.htm. Accessed August 9, 2017. 11. Takeda Pharmaceutical. Takeda announces FDA accelerated approval of Alunbrig (brigatinib). Press release. www.takeda.com/newsroom/newsreleases/2017/alunbrig-fda-approval/. Accessed September 6, 2017. 12. Kim DW, Tiseo M, Ahn M, et al. 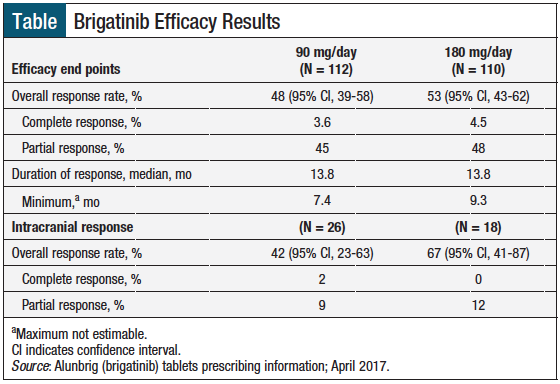 Brigatinib in patients with crizotinib-­refractory anaplastic lymphoma kinase-positive non-small-cell lung cancer: a randomized, multicenter phase II trial. J Clin Oncol. 2017;35:2490-2498. 13. Alunbrig (brigatinib) tablets [prescribing information]. Cambridge, MA: Takeda Pharmaceutical; October 2017. 14. ClinicalTrials.gov. ALTA-1L study: a phase 3 study of brigatinib versus crizotinib in ALK-positive advanced non-small cell lung cancer patients (ALTA­1L). https://clinicaltrials.gov/ct2/show/NCT02737501. Accessed August 11, 2017.